In Wait and See, Wendy Pope shows women how to focus on the Person of their faith rather than the object of their wait. This curriculum kit explores how women can view God's pauses as opportunities to know Him better. 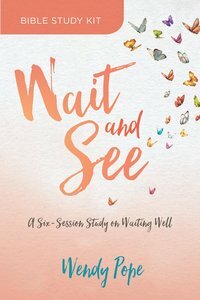 The Wait and See DVD has further teaching from Wendy Pope that corresponds with the participant's guide, which makes this curriculum kit ideal for small groups to explore living peacefully during faithful waiting. About "Wait and See: Finding Peace in God's Pauses and Plans (Curriculum Kit)"